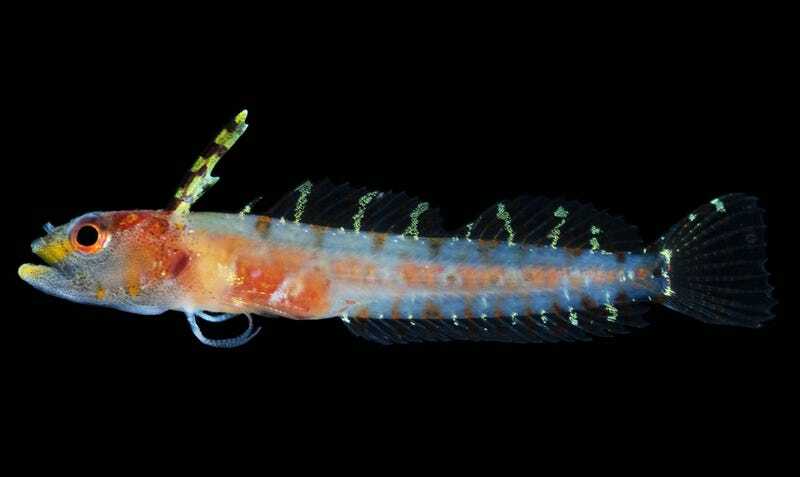 One of the new fish species discovered in the Rariphotic, Haptoclinus dropi was named for the Smithsonian’s Deep Reef Observation Project. Very little is known about deep reefs which are only observable using submersibles. A team of Smithsonian explorers has made a startling discovery while diving in a reef system off the coast of Curaçao: once you drop 400 below the surface, there’s an undefined ecosystem with unnamed species that’s hardly ever been studied. During 80 manned-submarine dives between 400 to 1,000 feet, the team explored explored a 0.08 square mile patch of this “twilight” ocean zone, which has very low light and lies below the reef-building coral zone; the team observed about 4,500 fish representing 71 species, and named six new genera and about 30 new species! In a paper published in Nature earlier this week, the explorers proposed dubbing this new ocean-life zone the rariphotic zone. Based on these findings, the Smithsonian researchers and co-author Luke Tornabene have proposed adding rariphotic to the ocean-zone life zones, sliding it right between mesophotic (between 130 - 400 feet, with medium light; pretty much the maximum depth at which reef-building corals can survive), and deep aphotic (below 300 meters, the place of nightmares, pitch black filled creatures with huge teeth and huge eyes). Most of the species discovered in the rariphotic zone are more similar to friendly reef fish than they are to the horrific deep-ocean fish; these findings indicate that many reef-fish have evolutionary cousins that have depth range much greater than previously thought. Representative Caribbean fishes inhabiting the rariphotic zone off Curaçao. Haptoclinus dropi (Labrisomidae); Pontinus castor (Scorpaenidae); Anthias asperilinguis (Serranidae); Lipogramma evides (Grammatidae); Serranus notospilus(Serranidae); Polylepion sp. (Labridae). Photograph of A. asperilinguis by Patrick Colin, other photographs by C. C. Baldwin and D. R. Robertson. These findings of a new ocean-life zone come at a moment when so much of marine life is disappearing. Overfishing and pollution have driven stocks of many large oceangoing fish, such as sharks, tuna and swordfish to decline by over 80 percent. And coral reefs, which provide a home for about 25% of all marine life, are at enormous risk from rising ocean temperatures, which cause a disassociation between corals and the symbiotic algae that live in their tissues. If we don’t halt climate change, more than 80% of reefs will likely suffer severe bleaching by 2040. By 2100, pretty much every reef on the planet will be at risk. If we continue with business as usual, we might never get a chance to fully understand newly discovered rariphotic zone. “We hope that by naming the deep-reef rariphotic zone, we’ll draw attention to the need to continue to explore deep reefs,” said Baldwin.